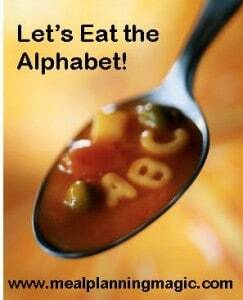 Eating the Alphabet-A New Year for YOU to be a part of it! A couple of years ago I started the Eating the Alphabet series. Inspired by the picture book of the same name by Lois Elhert, our family has had a great time coming up with ideas to eat more fruits and vegetables and my kids really enjoy it. I’ve been hit or miss, though, on following through so this year I’m creating an opportunity for YOU to share in the fun and we can exchange even MORE ideas to help our families add more fruits and vegetables to their meals! I’m hoping that if we join together we can be inspired and discover yummy new ways to enjoy our produce. Every month I will post a recipe for the letter that we’re on. Because it can be a little intense to try and keep up with a new recipe EVERY week (or even every other week), I’ve paired up most letters and for some of the more difficult letters, grouped even more. If you’re a blogger, you can prepare and post about your own recipe. If you’re a reader, then add your own ideas in the comments each month. I hope you’ll join me! Read on for more details and be on the lookout for our unveiling in February! Join the Eating the Alphabet Challenge! This linky party is open to everyone! If you’re a blogger, then prepare and post about your own fruit or vegetable recipe. If you’re not a blogger, then make a note to check back each month for new recipes and ideas for eating more fruits and vegetables! It’s easy to join! Just complete the form below. After it’s received you will be added and receive an email with more details on what to do. Please allow a couple of days to receive the email as I will do them in batches rather than each individual entry. There are a few simple rules to follow so that we can all benefit from what this linkup is intended to be all about! Bloggers who want to try out and share via a post on their own blog a fruit or vegetable recipe (or grains and beans/legumes) that corresponds to different letters of the alphabet. Choose a recipe from any source. It could be from another blog (credit, please, if so! ), one you found in a favorite magazine, cookbook or online, or even a recipe you’ve prepared for years. Just be sure to include the recipe in your post! This Eating the Alphabet challenge is once a month and everyone will post on the 15th of the month. I’m a little flexible on this but I will be posting mine on the 15th of each month so if you want to be linked up at the same time and receive maximum exposure, plan to do it on that day! The main reason is so that we can develop a resource that makes eating fruits and vegetables fun and interesting for our families. Another benefit is to increase traffic to your blog and because it’s fun! Once you’ve entered your info. into the form below I will have it forever. I will be touching base with you via email each month to see who’s in and who’s not so you can participate some months and other months maybe not. Think of it as a personal challenge as well as a blogging challenge to try new recipes! I will be checking each of the linkup entries to see if it fits with that month’s criteria. PLEASE do not link up any old random blog post. It must be from THAT month’s challenge theme. If you try to link up anything that does not meet the criteria, it will not be approved. I just want to make sure all of our readers are getting what they hoped for. I’m sure I’m not the only one that has clicked on a link thinking I’m getting more ideas to a specific theme and realize that it’s not at all related. No one likes to waste their time. Ok, that’s all. 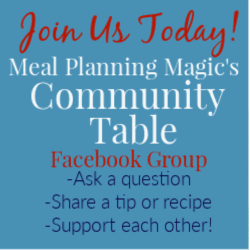 « Catch Up With Meal Planning Magic On television and online! How fun! I will have to figure out ways to make something sweet, because I love a challenge.